With over 100 players now moved on from League1 to professional environments around the globe, the Ontario-based division III league has become a popular spot to scout out the province's emerging talent. In 2018 there were some exceptional players on display in the league, with several youngsters making an impression with a quality of play that belied their age. 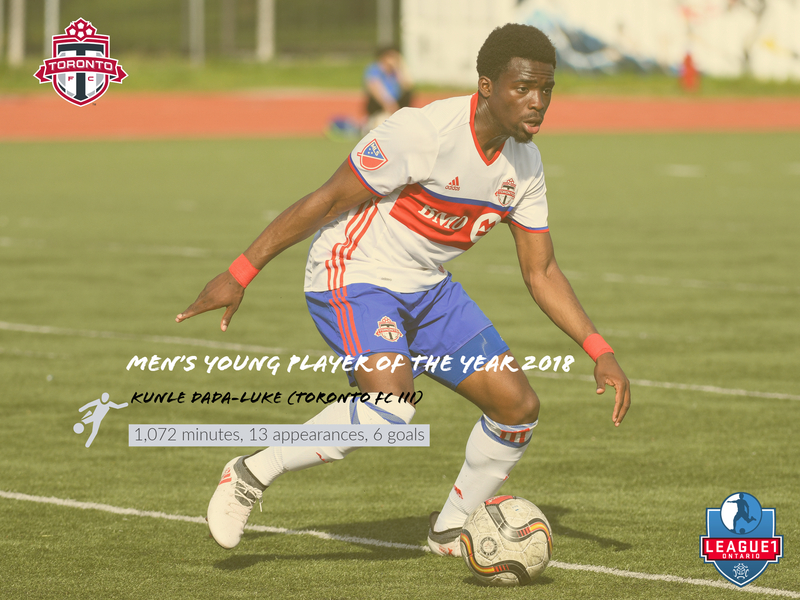 Meet the 2018 League1 Ontario Young Players of The Year! Bejleri's ability quickly caught the eye, both for her obvious abundance of technical ability and speed of play. It should have been no surprise. Bejleri has already made several appearances for the Albania U19 team, and been called up to the Albania Senior Women's National Team. By mid-season, Bejleri had established herself as a fixture in the Aurora side, and was the subject of the League1 Ontario video magazine, League1 Extra. Watch here as her coach describes her various qualities. By the conclusion of the season, Bejleri led her team in scoring and was a week in-week out starter. She's already declared for Quinnipac University in the NCAA and League1 supporters will look forward to seeing the player's development over the coming seasons. Following in the footsteps of former Aurora player Sarah Stratigakis, who won Young Player Of The Year in 2016, Bejleri becomes the second young talent from Aurora to win the award. Congratulations Markela Bejleri and Aurora FC on your 2018 League1 Ontario Women's Young Player Of The Year Award! League1 rosters are continuously brimming with young talent coming through, so it was no surprise that choosing one player as the 2018 Men's Young Player Of The Year would be a difficult task. In the end there couldn't just be one, with the merits of two players in particular attracting an equal number of votes from the League1 technical staff. In 2018, FC London had their best season yet on the men's side, ultimately finishing first in the regular season with a record of 12 wins, two losses and two draws. No team scored more goals than the Londoners and only three teams had a better defensive record. The side looked like the complete package. Within the ranks was a newcomer to the team, Marko Maletic, whose play stood out for his maturity and composure. Turning 19 mid-way through the season, Maletic showed the kind of promise that comes from a youth steeped in training at top level academies. Maletic was previously in world-famous Croatian pro academies, Hajduk Split and Dynamo Zagreb, before being signed up by Toronto FC academy. Joining London for the 2018 season, the 6 ft 3' defender was a mainstay from opening weekend, racking up 1,188 minutes in 15 appearances between regular season and playoffs, and providing a welcome defensive steadiness to the FC London team. Joining Maletic as the joint-recipient of the Young Player Of The Year award is a player from his former alma mater, Toronto FC. Kunle Dada-Luke turned 18 during this past League1 season, but it already felt like the young forward was well-established after first making a League1 appearance at the age of 16 for the Junior Reds. 2018 was a breakout season for the young player however, becoming a regular fixture in the TFC side. His pace, industry and ability certainly attracted attention within the professional club as well, with Dada-Luke earning five call-ups to Toronto FC II throughout the 2018 season. His quality was not lost on the national scouts either, with Dada-Luke getting his second Canada U17 call-up in early 2018. By season end, Dada Luke had rung up 1,072 minutes over 13 appearances, scoring on nearly half of those with six goals in his column by year-end. Stand-out was his two goal haul against Alliance FC in an exciting 4-4 draw at the end of August. 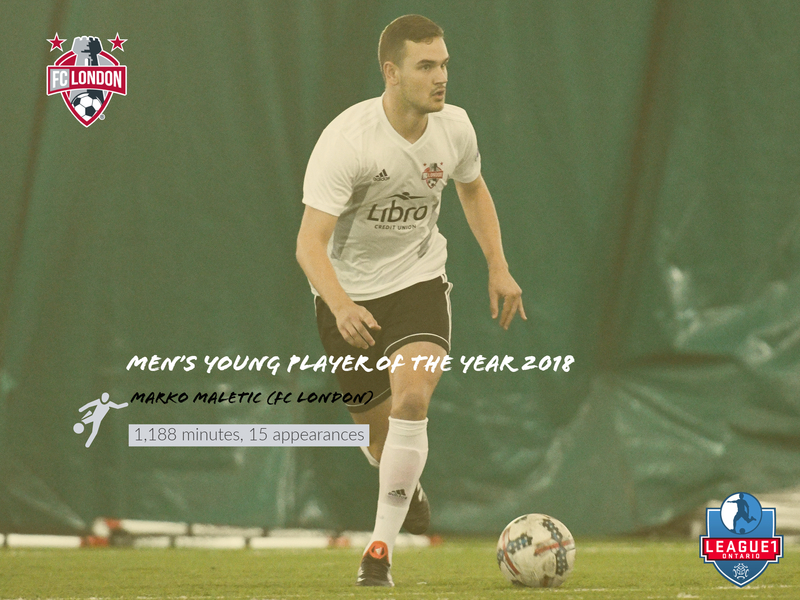 Congratulations Marko Maletic (FC London) and Kunle Dada-Luke (Toronto FC III) on your joint-2018 League1 Ontario Men's Young Player Of The Year Award!